This article is about the building type. For other uses, see Stadium (disambiguation). Most of the stadiums with a capacity of at least 10,000 are used for association football. Other popular stadium sports include gridiron football, baseball, cricket, the various codes of rugby, field lacrosse, bandy, and bullfighting. A large number of large sports venues are also used for concerts. Most dictionaries provide for both stadiums and stadia as valid English plurals, although etymological purists sometimes apply stadia only to measures of length in excess of 1 stadium. The oldest known stadium is the one in Olympia, in the western Peloponnese, Greece, where the Olympic Games of antiquity were held from 776 BC. Initially the Games consisted of a single event, a sprint along the length of the stadium. The stadion, a measure of length, may be related to the "Stadium", but the track at the Stadium at Olympia is longer than the conventional stadion. Greek and Roman stadiums have been found in numerous ancient cities, perhaps the most famous being the Stadium of Domitian, in Rome. The excavated and refurbished ancient Panathenaic Stadium hosted an early version of the Olympic Games in 1870, 1875, 1896 and 1906. The excavation and refurbishment of the stadium was part of the legacy of the Greek national benefactor Evangelos Zappas, and it was the first ancient stadium to be used in modern times. The first stadiums to be built in the modern era were basic facilities, designed for the single purpose of fitting as many spectators in as possible. With tremendous growth in the popularity of organised sport in the late Victorian era, especially association football in the United Kingdom and baseball in the United States, the first such structures were built. One such early stadium was the Lansdowne Road Stadium, the brainchild of Henry Dunlop, who organised the first All Ireland Athletics Championships. Banned from locating sporting events at Trinity College, Dunlop built the stadium in 1872. "I laid down a cinder running path of a quarter-mile, laid down the present Lansdowne Tennis Club ground with my own theodolite, started a Lansdowne archery club, a Lansdowne cricket club, and last, but not least, the Lansdowne Rugby Football Club – colours red, black and yellow." Some 300 cartloads of soil from a trench beneath the railway were used to raise the ground, allowing Dunlop to use his engineering expertise to create a pitch envied around Ireland. Other early stadiums from this period in the UK include the Stamford Bridge stadium (opened in 1877 for the London Athletic Club) and Anfield stadium (1884 as a venue for Everton F.C.). In the U.S., many professional baseball teams built large stadiums mainly out of wood, with the first such venue being the South End Grounds in Boston, opened in 1871 for the team then known as the Boston Beaneaters (now the Atlanta Braves). However, many of these parks caught fire, and even those that did not burn proved inadequate for a growing game. All of the 19th-century wooden parks were replaced, some after only a few years, and none survive today. The architect Archibald Leitch brought his experience with the construction of industrial buildings to bear on the design of functional stadiums up and down the country. His work encompassed the first 40 years of the 20th century. One of his most notable designs was Old Trafford in Manchester. The ground was originally designed with a capacity of 100,000 spectators and featured seating in the south stand under cover, while the remaining three stands were left as terraces and uncovered. It was the first stadium to feature continuous seating along the contours of the stadium. These early venues, originally designed to host football matches, were adopted for use by the Olympic Games, the first one being held in 1896 in Athens, Greece. The White City Stadium, built for the 1908 Summer Olympics in London is often cited as the first modern seater stadium, at least in the UK. Designed by the engineer J.J. Webster and completed in 10 months by George Wimpey, on the site of the Franco-British Exhibition, this stadium with a seating capacity of 68,000 was opened by King Edward VII on 27 April 1908. Upon completion, the stadium had a running track 24 ft wide (7.3 m) and three laps to the mile (536 m); outside there was a 35-foot-wide (11 m), 660-yard (600 m) cycle track. The infield included a swimming and diving pool. The London Highbury Stadium, built in 1913, was the first stadium in the UK to feature a two-tiered seating arrangement when it was redesigned in the Art Deco style in 1936. During these decades, parallel stadium developments were taking place in the U.S. The Baker Bowl, a baseball park in Philadelphia that opened in its original form in 1887 but was completely rebuilt in 1895, broke new ground in stadium construction in two major ways. The stadium's second incarnation featured the world's first cantilevered second deck (tier) in a sports venue, and was also the first baseball park to use steel and brick for the majority of its construction. Another influential venue was Boston's Harvard Stadium, built in 1903 by Harvard University for its American football team and track and field program. It was the world's first stadium to use concrete-and-steel construction. In 1909, concrete-and-steel construction came to baseball with the opening of Shibe Park in Philadelphia and, a few months later, Forbes Field in Pittsburgh. The latter was the world's first three-tiered sporting venue. The opening of these parks marked the start of the "jewel box" era of park construction. The largest stadium crowd ever was 199,854 people watching the final match of the 1950 World Cup at Rio de Janeiro's Maracanã on 16 July 1950. Domed stadiums are distinguished from conventional stadiums by their enclosing roofs. Many of these are not actually domes in the pure architectural sense, some being better described as vaults, some having truss-supported roofs and others having more exotic designs such as a tensegrity structure. But, in the context of sports stadiums, the term "dome" has become standard for all covered stadiums, particularly because the first such enclosed stadium, the Houston Astrodome, was built with an actual dome-shaped roof. Some stadiums have partial roofs, and a few have even been designed to have moveable fields as part of the infrastructure. The Mercedes-Benz Superdome in New Orleans is a true dome structure made of a lamellar multi-ringed frame and has a diameter of 680 feet (210 m). It is the largest fixed domed structure in the world. Different sports require fields of different size and shape. Some stadiums are designed primarily for a single sport while others can accommodate different events, particularly ones with retractable seating. Stadiums built specifically for association football are quite common in Europe; however, Gaelic games stadiums (such as the incomplete Croke Park) would be most common in Ireland, while ones built specifically for baseball or American football are common in the United States. The most common multiple use design combines a football pitch with a running track, a combination which generally works fairly well, although certain compromises must be made. The major drawback is that the stands are necessarily set back a good distance from the pitch, especially at the ends of the pitch. In the case of some smaller stadiums, there are not stands at the ends. When there are stands all the way around, the stadium takes on an oval shape. When one end is open, the stadium has a horseshoe shape. All three configurations (open, oval and horseshoe) are common, especially in the case of American college football stadiums. Rectangular stadiums are more common in Europe, especially for football where many stadiums have four often distinct and very different stands on the four sides of the stadium. These are often all of different sizes and designs and have been erected at different periods in the stadium's history. The vastly differing character of European football stadiums has led to the growing hobby of ground hopping where spectators make a journey to visit the stadium for itself rather than for the event held there. In recent years the trend of building completely new oval stadiums in Europe has led to traditionalists criticising the designs as bland and lacking in the character of the old stadiums they replace. However, since the requirements for baseball and football are significantly different, the trend has been toward the construction of single-purpose stadiums, beginning with Kansas City in 1972–1973 and accelerating in the 1990s. In several cases, an American football stadium has been constructed adjacent to a baseball park, to allow for the sharing of mutual parking lots and other amenities. With the rise of MLS, the construction of soccer-specific stadiums has also increased since the late 1990s to better fit the needs of that sport. In many cases, earlier baseball stadiums were constructed to fit into a particular land area or city block. This resulted in asymmetrical dimensions for many baseball fields. Yankee Stadium, for example, was built on a triangular city block in The Bronx, New York City. This resulted in a large left field dimension but a small right field dimension. 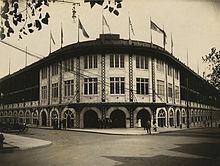 Before more modern football stadiums were built in the United States, many baseball parks, including Fenway Park, the Polo Grounds, Wrigley Field, Comiskey Park, Tiger Stadium, Griffith Stadium, Milwaukee County Stadium, Shibe Park, Forbes Field, Yankee Stadium, and Sportsman's Park were used by the National Football League or the American Football League. (To a certain extent, this continues in lower football leagues as well, with TD Ameritrade Park being used as the home stadium of the United Football League's Omaha Nighthawks.) Along with today's single use stadiums is the trend for retro style ballparks closer to downtown areas. Oriole Park at Camden Yards was the first such ballpark for Major League Baseball to be built, using early-20th-century styling with 21st-century amenities. Bramall Lane was reportedly the first floodlit stadium. Floodlighting in association football dates as far back as 1878, when there were floodlit experimental matches at Bramall Lane, Sheffield during the dark winter afternoons. With no national grid, lights were powered by batteries and dynamoes, and were unreliable. An "all-seater" stadium has seats for all spectators. Other stadiums are designed so that all or some spectators stand to view the event. The term "all-seater" is not common in the U.S., as very few American stadiums have sizeable standing-only sections. Poor stadium design has contributed to disasters, such as the Hillsborough disaster and the Heysel Stadium disaster. Since these, all Premier League, UEFA European Championship and FIFA World Cup qualifying matches require all spectators to be seated. Many stadiums make luxury suites or boxes available to patrons at high prices. These suites can accommodate fewer than 10 spectators or upwards of 30 depending on the venue. Luxury suites at events such as the Super Bowl can cost hundreds of thousands of dollars. Due to the number of people congregating in stadiums and the frequency of events, many notable accidents have occurred in the past, some causing injury and death. For example, the Hillsborough disaster was a human crush at Hillsborough Stadium in Sheffield, England on 15 April 1989. The resulting 96 fatalities and 766 injuries makes this the worst disaster in British sporting history. Security features that have been adopted include armed surveillance, Identity document checks, video surveillance, metal detectors and security searches to enforce rules that forbid spectators to carry dangerous or potentially dangerous items. Modern stadiums, especially the largest among them, are megaprojects that can only be afforded by the largest corporations, wealthiest individuals, or government. Sports fans have a deep emotional attachment to their teams. In North America, with its closed-league "franchise" system, there are fewer teams than cities which would like them. This creates tremendous bargaining power for the owners of teams, whereby owners can threaten to relocate teams to other cities unless governments subsidize the construction of new facilities. In Europe and Latin America, where there are multiple association football clubs in any given city, and several leagues in each country, no such monopoly power exists, and stadiums are built primarily with private money. Outside professional sports, governments are also involved through the intense competition for the right to host major sporting events, primarily the Summer Olympics and the FIFA World Cup (of association football), during which cities often pledge to build new stadiums on order to satisfy the International Olympic Committee (IOC) or FIFA. In recent decades, to help take the burden of the massive expense of building and maintaining a stadium, many American and European sports teams have sold the rights to the name of the facility. This trend, which began in the 1970s, but accelerated greatly in the 1990s, has led to sponsors' names being affixed to both established stadiums and new ones. In some cases, the corporate name replaces (with varying degrees of success) the name by which the venue has been known for many years. But many of the more recently built stadiums, like the Volkswagen Arena in Wolfsburg, Germany, have never been known by a non-corporate name. The sponsorship phenomenon has since spread worldwide. There remain a few municipally owned stadiums, which are often known by a name that is significant to their area (for example, Boston's Fenway Park). In recent years, some government-owned stadiums have also been subject to naming-rights agreements, with some or all of the revenue often going to the team(s) that play there. One consequence of corporate naming has been an increase in stadium name changes, when the namesake corporation changes its name, or if it is the naming agreement simply expires. Phoenix's Chase Field, for example, was previously known as Bank One Ballpark, but was renamed to reflect the takeover of the latter corporation. San Francisco's historic Candlestick Park was renamed as 3Com Park for several years, but the name was dropped when the sponsorship agreement expired, and it was another two years before the new name of Monster Cable Products' Monster Park was applied. Local opposition to the corporate naming of that particular stadium led San Francisco's city council to permanently restore the Candlestick Park name once the Monster contract expired. More recently, in Ireland, there has been huge opposition to the renaming of Dublin's historic Lansdowne Road as the Aviva Stadium. Lansdowne was redeveloped as the Aviva, opening in May 2010. On the other hand, Los Angeles' Great Western Forum, one of the earliest examples of corporate renaming, retained its name for many years, even after the namesake bank no longer existed, the corporate name being dropped only after the building later changed ownership. This practice has typically been less common in countries outside the United States. A notable exception is the Nippon Professional Baseball league of Japan, in which many of the teams are themselves named after their parent corporations. Also, many newer European football stadiums, such as the Macron and Emirates Stadiums in England and Signal Iduna Park and Allianz Arena in Germany have been corporately named. During the 2006 FIFA World Cup in Germany, some stadiums were temporarily renamed because FIFA prohibits sponsorship of stadiums. For example, the Allianz Arena in Munich was called the FIFA World Cup Stadium, Munich during the tournament. Likewise, the same stadium will be known as the "München Arena" during the European Competitions. Similar rules affect the Imtech Arena and Veltins-Arena. This rule applies even if the stadium sponsor is an official FIFA sponsor—the Johannesburg stadium then commercially known as "Coca-Cola Park", bearing the name of one of FIFA's major sponsors, was known by its historic name of Ellis Park Stadium during the 2010 FIFA World Cup. Corporate names are also temporarily replaced during the Olympics. Although concerts such as for classical music had been presented there for decades, from the 1960s stadiums began to be used as live venues for popular music, giving rise to the term "arena rock" or "stadium rock", particularly for forms of hard rock and progressive rock. The origins of stadium rock are sometimes dated to when The Beatles played Shea Stadium in New York in 1965. Also important was the use of large stadiums for American tours by bands in the later 1960s, such as The Rolling Stones, Grand Funk Railroad and Led Zeppelin. The tendency developed in the mid-1970s as the increased power of amplification and sound systems allowed the use of larger and larger venues. Smoke, fireworks and sophisticated lighting shows became staples of arena rock performances. Key acts from this era included Journey, REO Speedwagon, Boston, Foreigner, Styx, Kiss, Peter Frampton and Queen. In the 1980s arena rock became dominated by glam metal bands, following the lead of Aerosmith and including Mötley Crüe, Quiet Riot, W.A.S.P. and Ratt. Since the 1980s, rock, pop and folk stars, including the Grateful Dead, Madonna, Britney Spears, Beyoncé, Lepa Brena, Taylor Swift, have undertaken large-scale stadium based concert tours. ^ a b c "Stadium History". ^ "History of Goodison Park". ToffeeWeb. Retrieved 3 April 2010. ^ Parry, Haydn. "Super Bowl XLVII: New Orleans' pride restored after Katrina". BBC Sport. BBC. Retrieved 15 February 2015. ^ Inhabitat (20 May 2009). "Taiwan's solar stadium 100% powered by the sun". The Guardian. Retrieved 2 September 2017. ^ Vennard, Martin (13 April 2013). "How do you give stadiums atmosphere?". BBC News. Retrieved 2 September 2017. ^ J., Grant Jr., Thomas (9 August 2018). "Green Monsters: Examining the Environmental Impact of Sports Stadiums". Villanova Environmental Law Journal. 25 (1). ^ "Arena rock". AllMusic. Archived from the original on 8 August 2013. Retrieved 20 January 2011. ^ Thrills, Adrian (11 March 2011) "We STILL rock you: Re-releases chart Queen's rise to power" Daily Mail. Retrieved 16 June 2011. ^ Menn, D.; Staff, H.L.C. (1992). Secrets from the Masters. Hal Leonard. p. 75. ISBN 978-1-61774-463-1. Retrieved 12 February 2015. ^ Jackson, B. (2006). Grateful Dead Gear: The Band's Instruments, Sound Systems, and Recording Sessions from 1965 to 1995. Music Series. Backbeat Books. p. 258. ISBN 978-0-87930-893-3. Retrieved 12 February 2015. ^ Izundu, Chi (9 September 2012). "Lady Gaga's Born This Way Ball Tour starts in the UK". BBC. Retrieved 10 February 2015. ^ "Taylor Swift". Gillette Stadium. Retrieved 10 February 2015. ^ Vanhorn, Terri (15 December 1999). "Britney Spears To Tour U.S. Arenas With LFO". MTV. Retrieved 10 February 2015. Serby, Myron W. (1930). The Stadium; A Treatise on the Design of Stadiums and Their Equipment. New York, Cleveland: American Institute of Steel, inc. OCLC 23706869. "Stadium DB – Database of Football Stadiums". "Football Tripper – Independent Stadium Guides".